China is richly endowed with Cambrian strata yielding some of the best-preserved fossils known anywhere in the world. The trilobites are most important element in the fauna, and of scientific relevance for several reasons. First, they are of regional importance in the precise correlation of strata, and are of primary use in characterising mappable formations. Second, some of the species are widespread internationally, and these permit the placing of Chinese stratigraphical schemes within the global chronostratigraphy. Thirdly, the variety, relationships and endemicity of the faunas contributes to the broad questions of how evolution proceeded in the Cambrian, and is relevant to debates about whether special conditions applied at the early stage of the Phanerozoic radiation. 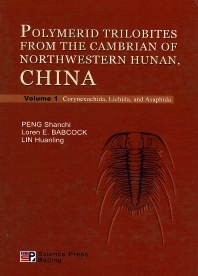 Volume 1 of this set contains general geologic information concerning the Huaqiao Formation of the northwestern Hunan, lithostratigraphic data, biostratigraphic zonation, detailed description of three stratigraphic sections, and the systematic of corynexochid, lichid, and as aphid trilobites. Volume 2 contains systematic treatments of ptychopariids, eodiscids, trilobites of uncertain affinity, and some undertermined sclerites. In both volumes, considerable effort was made to reillustrate type material of many previously described taxa. In some older literature, illustrations were not always reproduced well, so the new illustrations should help to clarify taxonomic concepts. Geologists and Paleontologists specifcally interested in Cambrian geology.